Started in 1976, this journal publishes papers on both fundamental and applied research in various branches of textile technology and allied areas such as Production and properties of natural and synthetic fibres (including industrial fibres), yarns and fabrics; Physics and chemistry of fibre forming polymers; Chemical and finishing processes; Fibre-reinforced composites; Garment technology; Analysis, testing and quality control; Application of microprocessors; Instrumentation; application of nanotechnology in textiles; and Industrial engineering. 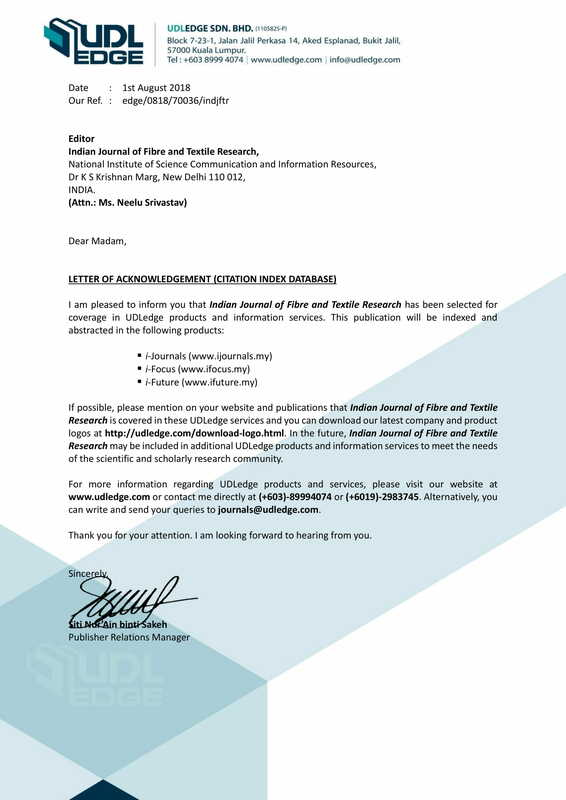 Coverage in abstracting/indexing services: World Text Abstr, Text Technol Digest, Chem Abstr, Art and Archaeol Tech Abstr, Refrativnyi Zhurnal, Scopus, Paper CLIPP, TEXINCON, Indian Science Abstract, Directory of Open Access Journals. Annual Subscription: Rs. 1600.00 US $ 300.00 (including AIR MAIL charges) .